I was getting real worried that I wasn't going to be able to continue the tradition of baking B something special for Valentine's Day, but our replacement oven came just in time to make something super sweet for the occasion. 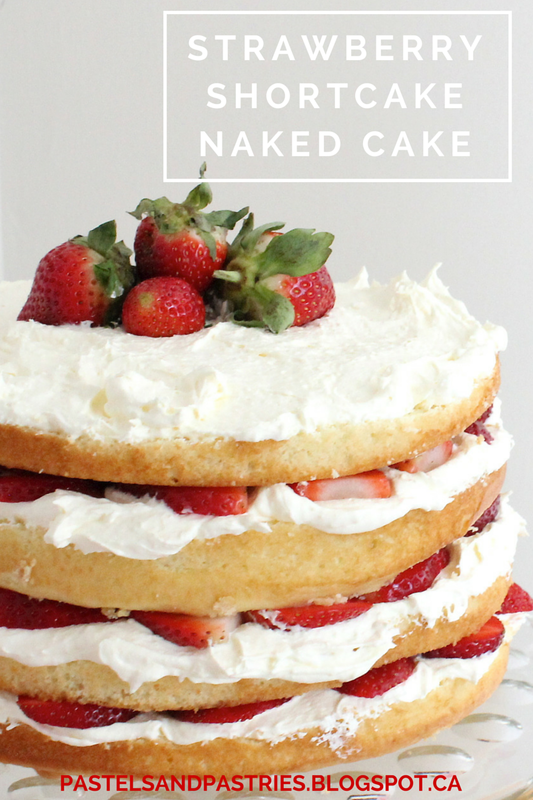 Naked cakes are so elegant without even trying! I love the rustic feel and they are actually really easy to put together! Here are my steps to put together this monster sized cake. 1. Bake cake of choice. Feel free to use a white boxed cake mix if you are short on time. I baked mine in two 9" round cake pans the day before I put the cake together. If you are putting the cake together on the same day as baking, let cakes cool entirely. 2. Make icing. I used my mom's cool whip icing. It's light and airy, not too sweet, and is a favourite in my household! Put in fridge for 20 minutes to thicken. 3.Wash and slice strawberries. Make sure you dry the berries really well so they don't bleed all over the icing. 4. Using fishing wire slice the two cooled cakes horizontally, so you now have 4 thin cakes. Also cut off any excess cake off the two top pieces to get a flatter look. 1. Place first cake on cake stand. Layer with 1 cup icing- be sure to load the icing around the edges, more so than the middle, as you want the icing to spill over the sides. Top icing with strawberry slices. 2. Place second cake on top. Top with 1 cup of icing (on this layer I added 2 tablespoons of strawberry jam for some added moisture- this is optional). Top icing with strawberry slices. 3. Repeat step 2 with third cake. 4. Layer final cake and top with remaining icing. Add a few whole strawberries as a rustic cake topper. This looks so yummy. I love strawberries, so I think I will need to bookmark this post and refer back to it soon! I promise- it's easy and worth the little bit of effort! oh my... this looks so decadent!!! love it! OMG this looks amazing and I want to make this NOW! Awesome post!